This is another one of those reviews which I've never written because I take the product for granted. 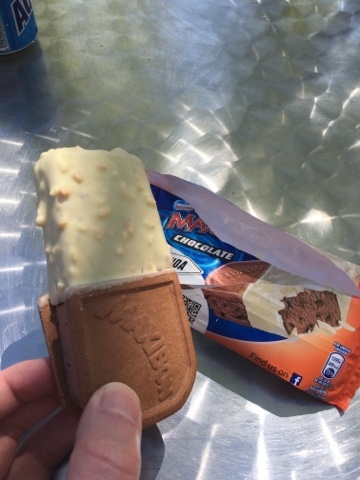 If I'm in mainland Europe and it's hot then it's fairly safe to say I'll eat a MaxiBon at some point. I've been doing this for close to 20 years. In the UK the practice of putting a slice of ice cream between two wafers or biscuits seems to have vanished. As it's something that I grew up with I get very nostalgic for these. And boy have they evolved over the years. Here we have the latest iteration - it's a MaxiBon chocolate but it has so much going on. 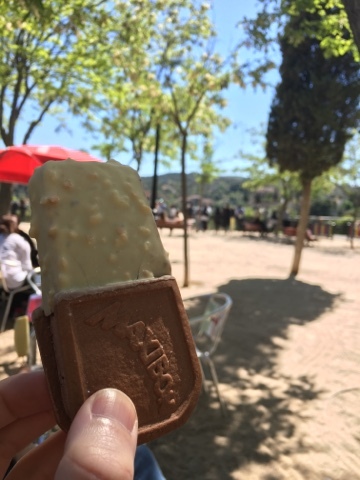 Firstly you can now see that only half of the bar is ice cream covered by biscuit so it doesn't melt, the top half has been dipped in chocolate instead. Here we see its White choc coating, normal choc biscuit and ice cream and dark choc chips. In Toledo it's still better to eat this in the shade than to risk a meltdown. It's a very filling bar, and once you bite into it it's a race to finish before you lose some. We had a table and a nice can of Aguarius in the shade so managed without issue. A couple of the import shops stock these in the UK but I think it is better kept for the blazing heat and the spectacle of trying to explain exactly which of the different flavours you actually wanted.